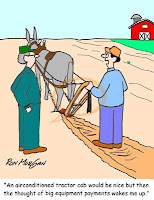 Conner Voss explains why today's Farming is not what it used to be! Neither of us was born into farming. There is no land to return to, and no native cultural knowledge to draw upon. Our approach is largely a scratch-and-sniff, pay-to-play, fake-it-’till-you-make-it type of operation. Given this pursuit, there is occasion to consider how wealth (specifically land) is transferred through time and space in our culture. We come from solid, middle-class families who have worked tirelessly to provide us with a plethora of options in life. In the first place, this safety net allows us to imagine a life as farmers at all. Our parents emerged during a time when small family farms were evaporating amidst the rapid commoditization of our food system, along with a depressing decline in rural agrarian communities. It was the ’50s, and canned food was cool. And now, as the privileged offspring of baby-boomers, we are bequeathed the resources to examine voluntary simplicity, endowed the good credit to gamble with debt, and gifted the ideological support to swim against the social fish ladder. Even so, given our relatively affluent backgrounds, strong educations and bull-headed determination, good farmland feels like an uncomfortable financial stretch. Conner Voss first joined 'Oregon Tilth' as an AmeriCorps member and has served as the Organic Education Center’s garden coordinator since October 2008. He is currently establishing a farm. This essay originally appeared in In Good Tilth , a magazine devoted to the organic movement. IGT is project of Oregon Tilth , a non-profit advocating for biologically sound agriculture.